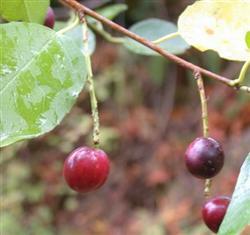 The Catalina Cherry is a species Native to the Channel Islands, but does well in well drained, sun to part-shade areas. The white, catkin like flowers bloom from March to June and set to deep purple to black fruits in the Fall. The shrubs can be pruned into trees, developing an attractant for birds, bees, and pollinators throughout the seasons. The leaves are a light green, with slighlty cerrated edges, and leathery to the touch.It requires deep watering monthly once established, and is resistance to drought and frost.